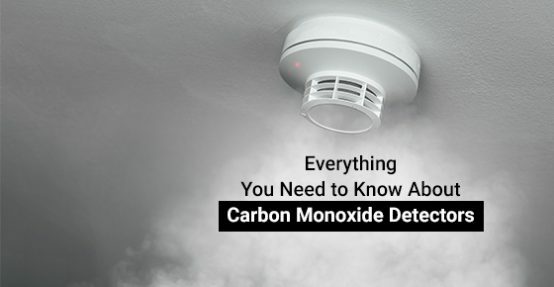 Everything You Need to Know About Carbon Monoxide Detectors | Hi-Lite Electric Inc.
10 July, 2018 Hi-Lite Electric Inc. Commonly referred to as the silent killer, carbon monoxide is nearly impossible to detect, and its harmful effects are often only realized once it’s too late. Carbon monoxide can be harmful even when inhaled in low dosages and can be lethal to those that are exposed to a high concentration for a long period of time. How can we protect ourselves against this silent killer? The answer lies in gaining awareness about carbon monoxide poisoning and learning of ways to avert its effects. Carbon Monoxide is an odorless, colorless and a tasteless gas but is highly toxic. The gas is produced when carbon burns partially due to the insufficient supply of oxygen, as well as when wood, gasoline, coal, natural gas and heating oil are not burned properly. It originates mainly from industrial exhausts and vehicles and is a major contributor to acid rain. Commonly used home appliances such as ovens, dryers, fireplaces, water heaters, or cars also emit carbon monoxide into the atmosphere. When inhaled in large amounts, carbon monoxide reaches the lungs and combines with hemoglobin in the blood in place of oxygen. This forms carboxyhemoglobin which impedes the ability of blood to carry oxygen to the various organs in our body, causing headache, nausea, vomiting, flu, or a cold in the short term. If left untreated, these can become more lethal and lead to food poisoning, muscle tear, brain damage, seizure and even coma. To protect your family from the deadly clutches of carbon monoxide, you need to install carbon monoxide detectors in your home. These detectors are affordable, durable and are easy to install. To keep the carbon monoxide emissions in check, the authorities of certain cities, like those in Ontario, have made the inclusion of carbon monoxide detectors in homes compulsory, failing which, you could be penalized as per the local laws. Why should you have a carbon monoxide detector? The answer is simple – a carbon monoxide detector triggers an alarm as soon as the CO levels in your home rise beyond permissible limits. It works like a smoke detector and monitors the CO levels in your home environment by showing you regular updates of the levels of the gas in your home. With a Biomimetic sensorA gel is placed as an indicator that changes color as per the change in the CO levels in the air, setting off the alarm. Metal oxide semiconductorWhen the silica chip in the circuit senses CO, it brings down the electrical resistance in the detector, thereby, sounding the alarm. Electrochemical sensorChanges in electrical current inside the electrochemical solution occur when the electrodes, dipped in the solution, come in contact with carbon monoxide. This triggers the alarm. What should you do when the alarm goes off? If the alarm goes off, you need to move out of your house immediately to get fresh air and seek medical help to investigate if there is any flu-like symptom, which would indicate poisoning. Open all the windows and doors before heading out and do not enter the house until the alarm ceases to sound or the authorities have deemed it safe for you to do so. If this incident occurs, do not forget to contact a professional and have your home appliances checked to prevent such incidents in the future. Once the alarm activates itself, the detector must then be placed in a carbon monoxide-free atmosphere to become fully functional again. Where should you place a CO detector? You should first discuss with the local authorities and find out about the laws concerning carbon monoxide detectors before you make an investment. The detectors can be placed outside the bedrooms, on each floor of your house and in places outlined in the local laws. Safety operators also urge that the carbon monoxide detectors should be placed at a minimum of 15 feet away from any fireplace. CO detectors come in with many variants: for example, the plug-in detector, digital readout detectors, and the battery-operated one. For the plug-in variants, you need to make further arrangements for some kind of power back-up in the event of a load shedding while the battery-operated detector usually comes built-in with your home security system along with the smoke detectors. Of the three, the digital readout detectors are best recommended for home us. The main reason for this being the inbuilt display panel in the detector that allows you to see the current and previous levels of CO in parts per million. Depending on the levels displayed on the panel, you are sufficiently forewarned to get all your home appliances checked for possible mishaps and fix any issues before they escalate. How do you maintain a CO detector? Periodic maintenance and regular check-ups ensure longevity and smooth functionality of a CO detector which usually lasts for a span of 5-10 years. To make your detector ever prepared for responding to carbon monoxide emissions, you should ideally get it tested once a week or at least on a monthly basis. You can do so yourself by simply pressing the test or reset button on the detector. To enable the CO sensors to properly detect the carbon monoxide levels in the air, you should clean it once a month. After unplugging the device, you can vacuum or wipe clean the sensors in the detector. You should call up technicians once a year to have a look at your chimney, air ventilation system, and the heating system in your house. Gaps in their performance can also be the reason for increased carbon monoxide levels in your home environment. Carbon monoxide detectors generally come in with expiration date. You can increase the longevity of your device by 5-10 years by replacing the batteries regularly. Whether you are interested in making your first purchase or looking to replace your old carbon monoxide detector, Hi-Lite Electric Inc. has got you covered. Call at on 416-800-5536 or contact us here.